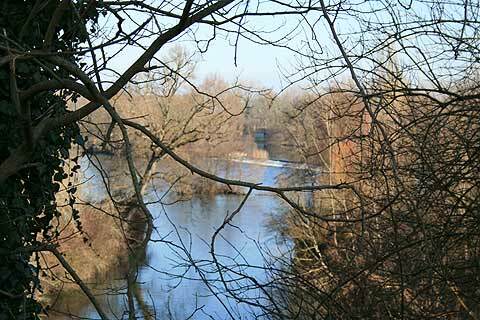 The River Isle passes through Perigueux, then continues towards the south-west, eventually meeting with the Dordogne River at Libourne. En route it passes several interesting villages and towns, and has some attractive stretches to explore. 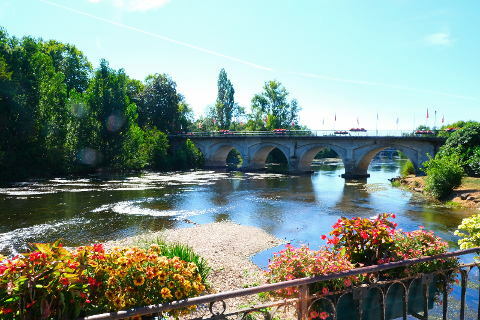 Unlike the neighbouring Dordogne and Vezere rivers the Isle river does not run through valleys packed with famous and beautiful villages or an incredible variety of prehistoric sites. It has a much more low-key charm and unfortunately, a rather busy road runs next to the River, reducing its appeal somewhat. Also many of the towns have suffered severe damage during their history - including the Hundred Years War and Wars of Religion, and again during World War 2, so there is little of great architectural interest to see in the towns. In order, as you follow the flow of the river, the main towns and villages are Perigueux, Saint-Astier, Neuvic, Mussidan and Montpon-Menéstérol. Perigueux is definitely the main sight to see on this stretch of the Isle river. Peigueux is a really beautiful town with a large, many domed cathedral, lots of Roman ruins and a delightful medieval centre. Be sure not to miss the The Gallo Roman Vesunna Museum, which has been superbly constructed to incorporate a Roman Villa. At Saint Astier, the main attraction is the large network of underground lime quarries that can be explored on a guided tour, and the gardens at nearby Chateau Mellet. There are also some attractive colombage houses to see in the town, and the nearby Chateau de Puyferrat can be visited. At Neuvic there is a 16th century chateau open to the public, in an attractive riverside location and surrounded by substantial botanical gardens. On the edge of town are a couple of restored colombage houses that are open allowing you to enter and see the inside of one of these buildings so typical in the region. Mussidan has a small museum dedicated to the traditional work practices in the region. There is also a monument to 52 hostages that were killed by the Nazis as reprisals in the town. Saturday morning, when the market is held, is the best time to visit Mussidan. Montpon-Menesterol is best known for the beautiful musical organs in a couple of its churches.